I am feeling exhausted, this grinding noise issue has been years, replaced lots of parts but still cannot get if fixed. 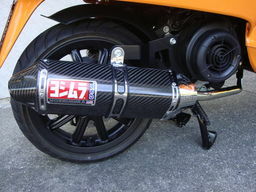 The situation is, when I go at high speed (above 90km/h) for a while, there will be a grinding noise coming from the gear box, and it is in sync with the throttle. The noise will not stop until it comes to a very low speed (20km/h), and it will not come back until you go high speed again. Using torque wench to tighten them, so they cannot be too loose. There sill be some minor grinding noise when turning the wheel by hand. 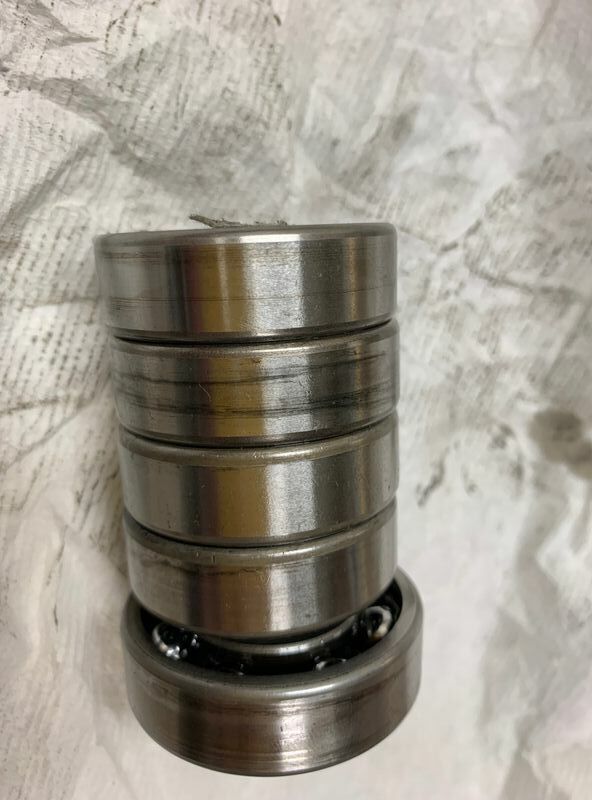 Both the nut at the engine shaft and wheel shaft was tightened too much, and the nut at the clutch was failed, noticed it when there is a gearing grinding noise when closing the throttle. Could there be any other possible issue from the CVT side? Should I go check the gear box or flywheel side? I would check the gear box oil level. What kind of bike? Year? Miles? Edit: sorry, I see now the title says ET4 150. Year and mileage would still be useful to know. How does the clutch side look and feel? You said it grinds when turned by hand - where from? If you take off the belt, does it still grind? If yes, suggests clutch or gearbox. If no, suggests variator side. I know you said the problem happens at speed, so this may be impossible, but a video of the grinding sound would help understand the problem. Or maybe you can ask someone who owns the same model to ride yours and help give impression of how bad it is and where from? 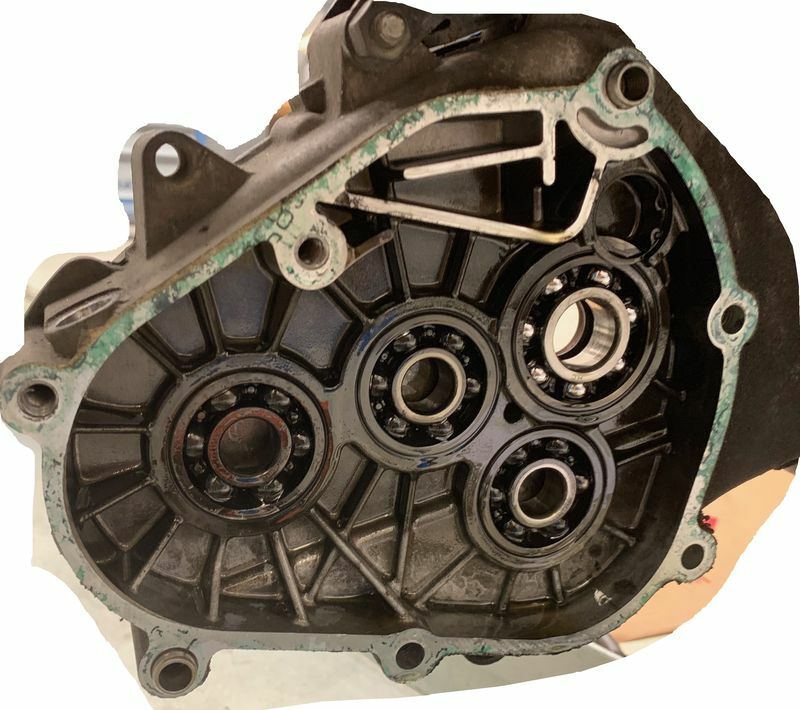 For the clutch, I have experience some noise coming from the metal plate as the holes on it getting larger and I have replaced the plate at 2017. The clutch itself turns perfectly without the belt and bell. 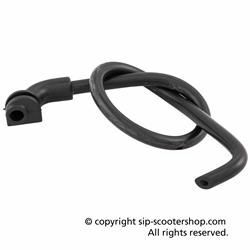 There will be some gear "kicking" noise when turning the rear wheel without the clutch and transmission cover, but when I pull the shaft toward the left from the bike, the noise will getting smaller. Seems something has to be put in place by tighten the clutch shaft on the transmission cover, the wheel do not turn a lot and make some noise when the cover is off, but I am not sure if it is the noise I am looking for. I wanted to look into the gear box, or may be get all the bearings replaced once I have it open. What tools and parts I should get before I open the gear box? Gasket, 4 bearings and 1 oil seal? Any special tools I need to replace the bearings? Is it by any chance more of a high speed whine. I have a friend here at work he has a LX 125. His transmission has a whine I can hear it if I follow him. I'm thinking it is the final drive. Bung the correct amount of STP Gearbox Treatment in there and see if the sound changes. If so it will confirm. Then you can plan. 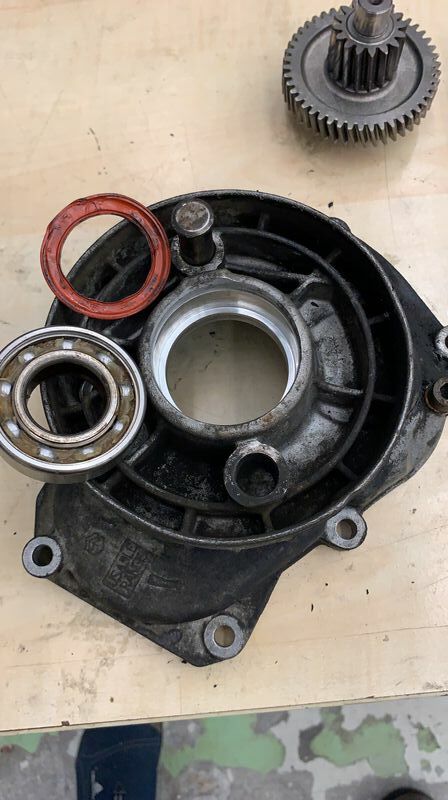 The original Minis for example where notorious for a gearbox whine it was the transfer gear (not unlike the Vespa final drive) the bearings would wear and cause the gear to run at a veeery slight angle. Run the scooter on the centre stand and see if you can generalize where the noise is coming from. 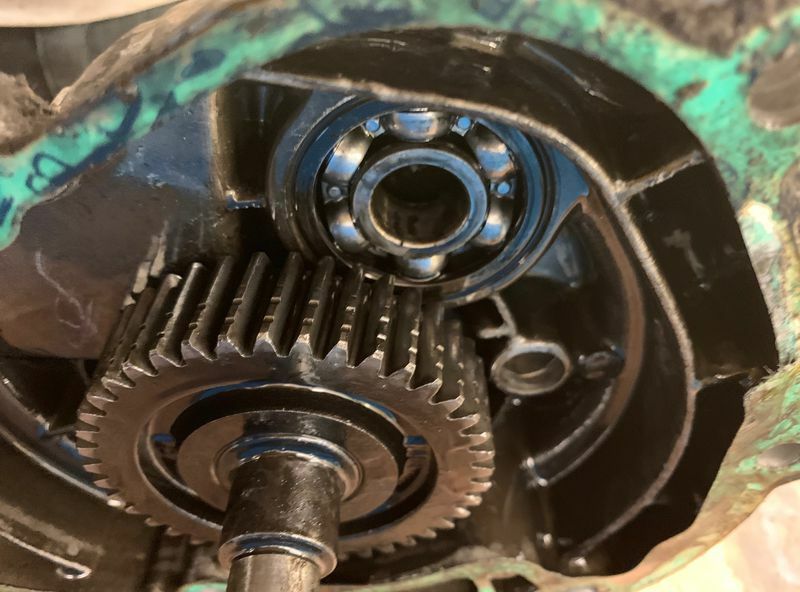 I have cracked open the gearbox, find out some of the bearings are badly seized, and there is a rusted rear wheel shaft which seized with the bearing. 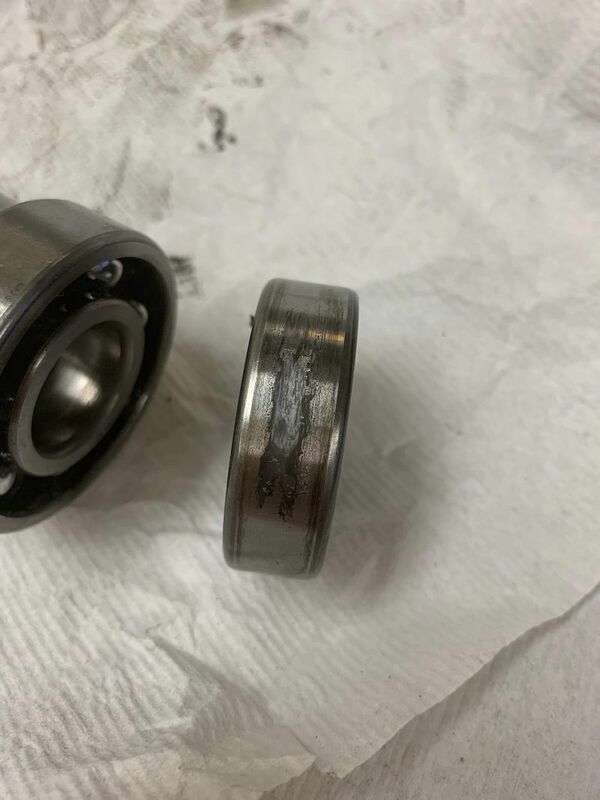 There are also burn mark on the bearing and casing, may be in high speed the outer ring of the bearing is turning with the shaft and making the noise. Once I have open the gear box, find out it is a little bit black inside. And the color and smell of the hub oil seems not normal. The grease in the sealed bearing on the gearbox cover was dried out. I have managed to use the "Paper towel" method to extract the blind bearing on the cover, but could not get the rest of them come out. Due to Chinese New Year, all the shops are closed for about 10 days, could not get the replacement bearing until then. My plan is to get the proper tool, then extract all the bearings out to get an replacement after then have back to work. Also, I find out there is a mark on the gear, seems it is machined on it, or is it need replacement? 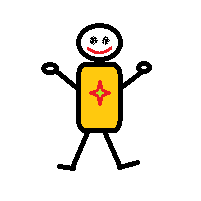 You mentioned Chinese New Year a couple of times - are you located in China? Best of luck sorting it out - I hope it is fixed soon! The marks on the gear look too even to be damage, but I am not sure. Hopefully someone else will have a more certain response for you. Yes and no, I am from Hong Kong, which supposed not to be a part of China. Normally we will resume our work on the fourth day. China will have a much longer holiday for CNY. But I am still wondering what is the cause for multi bearing failed even the sealed one. The sealed one is burned and it should be overheating the grease inside, but that is after the outer ring rotates together with the wheel. 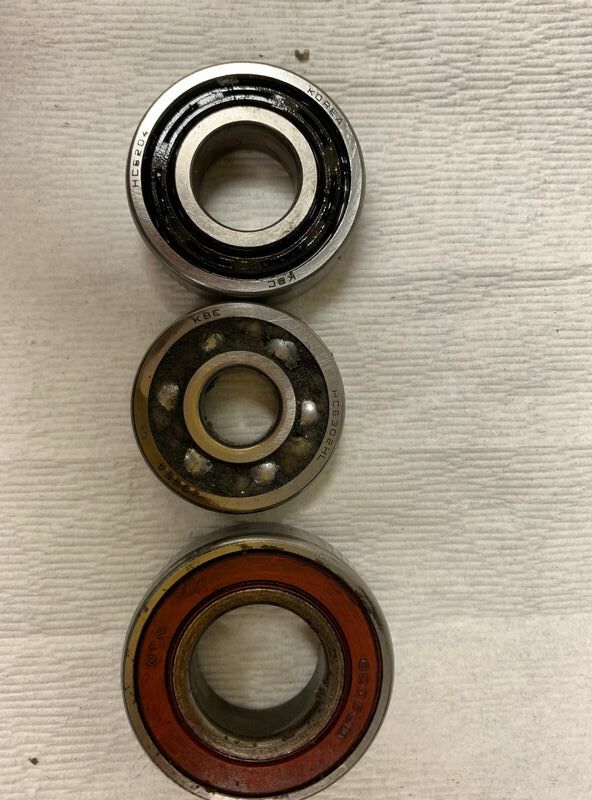 Suppose the bearings are designed for last for long, say more than 10 000km and 20 years. Mine is 2004 with 56000 on the clock only. Marks are normal, gears are fine. Remember you don't have to buy those bearings from Piaggo. They have the model numbers etched on the side. 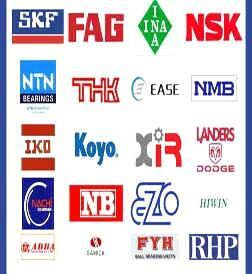 You just need to get good quality bearings like SKF, NTN, FAG etc. Just try motor parts stores etc. or google bearing shops HK. Take them along . Great bearing shop in Mong Kok. If you need any help in locating it after CNY pm me. The original bearings I believe it is from KBC(Koera), not able to find the information of the bearings itself. Will being the original one to the shop and ask them to get me some SKF may be. Before putting them all together I have to know what is the cause of this failure, I found the breather hose is degraded and very easy to break, the water might goes into the gearbox and contaminate the oil, may be? Wanted to ask sth about garage in HKG, I was used to get most of the work done by myself, and the job like changing tires will bring it to KinLik. I know there is one shop VESPAIR, but it is too far away from me, is there any other recommendation for Vespa? I would say no or incorrect oil. can we assume that they are the original bearings? A good bearing shop will take one look and go and get you some new ones. Will take minutes. They should be, I suppose we cannot get this brand of bearings in Hong Kong. I think you were OK BUT you should not use GL5 where there are brass or other alloys of soft metals. GL-5 has an additive that is fine for hardened gears but will corrode them. Nicholas, MotoPlex in Tokwawan Rd has done work for on my son’s scoot. They seem very professional and are now the official HK Vespa dealer. Not sure about older Vespa models. The bearing shop is Kowloon Bearing Shop. Corner of Soy/Canton Rd. If they don’t have it it’s probably not made. I have 2 ET4’s awaiting restoration and my son rides a Primaveria. 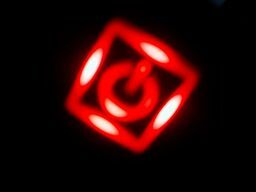 Opps I do not know about the GL-5 is not compatible with GL-3 requirement, justed learned that. Will put GL-3 or GL-4 into my hub from now on. I think I will just seal the hole, or glue another tube on it to prevent water from going into the gearbox. I do not have a very good experience with MotoPlex. I have called them for parts, and the first thing they ask for my reg. number, and reg. document, refuse to get any information without the document. The lady on the phone is very rude to me. Thanks for the info of the bearing shop, have check all shop will resume to normal opening hours on monday. How could you get the parts for ET4? Sometimes if you only need just 1 part, it is not possible to order it from overseas, the shipping cost will be 10 times of the parts. All bearings are out, could not get the bearing extraction tool, had made it by using a bolt and angle grinder. Found most of the blind bearings with burn marks/discoloration. Hope there will be no more problems from the gear box after replacing the bearings. All bearings replaced, found one of them is not used but it is there only. Freeze all the bearings in the freezer for a few hours before work, using the hot air gun to heat up the casing to about 100 deg c. But need a lot of effort for putting the bearings into the casing, hammer it hardly with the old bearing on top of it. It should not require this much of force to fit in the bearings. Re-fitting the oil seal, but one of them was pushed too much into the hole, but nothing I can do, no spare on hand. Using an PU hose and silicone sealant to replace the broken breather hose. The disappear after the work, hope it will never come again. Will get the oil replaced after 1 week of running to see is there any metal come out with the oil.